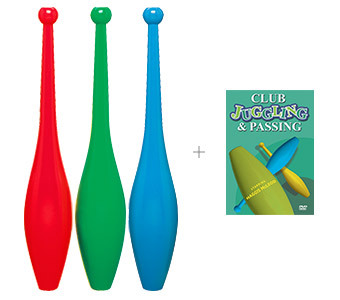 A great gift or starter kit, this set includes three of our popular Airflite juggling clubs and an instructional DVD. Our Airflite clubs feature classically styled one-piece design molded in a special formula polyethylene that is flexible and resilient, yet tough enough to withstand maximum abuse. Each club is properly balanced for juggling. This is achieved through controlled distribution of plastic during molding using our patented process. Excellent grip. Knobs are concave for balancing and chin rolls. Used by professionals as well as beginners. Merlyn Hall juggling in the Murray, Utah Fourth of July Parade using Airflight clubs which he had re-decorated. Connor the Juggler's quick and to the point how to juggle 4 clubs using dubé airflites.